As a minister of the Gospel of Jesus Christ, I believe that abortion is a non-negotiable issue. As a Christian and follower of Jesus Christ, you are commanded to respect LIFE. Any denomination or church that waffles on the Message of LIFE have lost their way. I have thought a lot about how to address the Message of Life in the pulpit. Being a Prolife Advocate is difficult especially with other prolifers. Some think I’m too bold, some think I’m not bold enough. It’s kind of like how Christians think and talk about each other; some are weak, some are stronger and both point critical fingers at each other. If you have not been persecuted or criticized as a Christian or Prolifer, then you’re doing it wrong. Is a picture worth a thousand words? YES. Some prolife advocates think that graphic photos of aborted children is the best way to address the abortion agenda. I don’t think those photos have a place in the church building (within the church body, YES); instead the biblical model of Life needs to be preached and taught thoroughly and correctly by the pastorate. This is what will lessen the so-called ‘need’ for abortion. But if you want to see what an aborted baby looks like at every gestational stage, or even the actual abortion procedure, just do a ‘Google’ search. I assure you, you will find things that won’t let you sleep at night. The Church has a hard time talking about the abortion issue, but in my experience it’s about the Message of Life, not of death. Yes, a child dies during an abortion but it’s us, the ‘living’, that make decisions to vote for one person or another that is either prolife or prochoice or proabortion. It’s those decisions and the Church that keep Roe v. Wade alive and well. And it’s also the responsibility of the members of every Church to demand that their Pastors preach the Message of Life. I know many of you have read the book ‘The Purpose Driven Life’…was the subject of abortion touched upon? No, but interestingly Mr. Warren partners with Bill and Melinda Gates who are mega supporters of Planned Parenthood. In fact, Bill Gates father – Bill Sr. – was the head of and a board member of Planned Parenthood. Always be very aware of Pastors and preachers you read after and support. I believe Mr. Warren needs to consider a RePurposed Driven Life – to one that will actually edify the Church body and defend the unborn. A Call to Arms ARMED with the Word of God. However, the Church, as a whole, has been woefully inadequate in getting the Message of Life out. The Church has stood by silently while millions of children have died these past 40 plus years. The Church typically stands on the excuse that the abortion issue is political. Is it political that innocent children die every day of at least 4000 per day in the United States? The answer is that abortion is a political card for Liberals; Conservatives believe that Life begins at conception and should be preserved as a right to Life and birth. Pastor, I am here to tell you that you can make a difference in the lives of the unborn! Each and every one of you probably know a woman that has had an abortion; in fact statistics say that 43% of all women under the age of 45 have had an abortion…and half of them have had more than one or multiple abortions. Think of how many post-abortive women are sitting in pews in every Church in America. Are they being ministered to or ignored? Evangelizing the lost is arduous at best; evangelizing the pre-abortive parent at the abortuary is even harder. By the time most pre-abortive moms and dads get to the abortuary, they have already rationalized God out of the decision even though God is trying so hard to get their attention. Most of these moms and dads believe that God has forsaken them, but the Word of God gives us hope that God knows each and every one of us despite or in spite of ourselves: “But God demonstrates His own love toward us, in that while we were still sinners, Christ died for us,” (Romans 5:8) AND ‘All have sinned and fall short of the glory of God’ (Romans 3:23). One of the points I try to make is that only Jesus Christ was meant to die for us, for our salvation. No unborn child was ever created to die for MY sins or YOUR sins. In other words, our unborn children are not created to be martyred for OUR greater good. An unborn child dying an abortion death for me does not enhance my life, instead it made my life empty of the beautiful gift that God had grace enough to give me. Are you really Prolife? There is this line in the dirt that prolifers stay on either side of – I stay on the side of making a difference in the statehouse and in churches; others are on the front lines making a difference with moms-to-be on the sidewalk in front of abortuaries. Much is the same with church members. There is more than one way to be a prolife advocate. You don’t have to be a sign carrying protester or sidewalk counselor; I believe God purposes certain people to do those things. 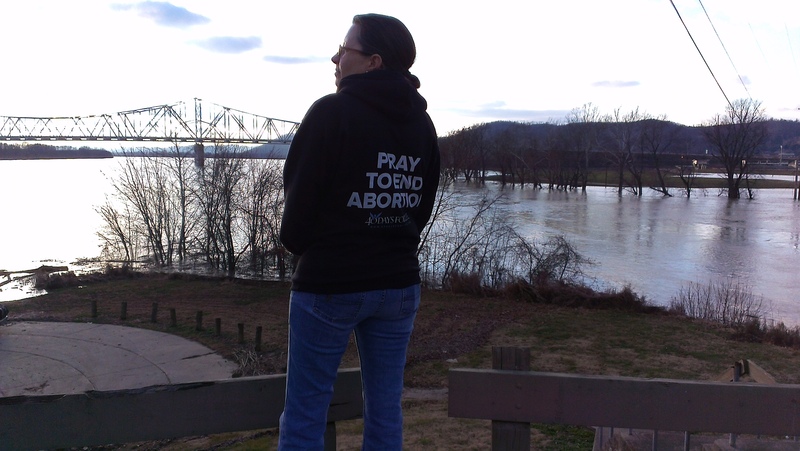 People drive past abortion centers where Prolifers are and throw trash at them and yell obscenities – but now and then you get a kind word and a beautiful testimony. I promise you, it’s well worth it. You may not copy, modify or distribute this material without written permission from the author. 1. I like the call to action, demand your Pastor speak on the issue. 2. Ask your leadership better questions, How is our being silent loving our neighbors when the laws that are being made hurts them? Thank you for writing this i am trying very hard myself to let people know how bad abortion is. people need to realize it really is murder. It’s a tough subject but it’s worth it.